There are many ways of doing it, not just the pose in the picture which may be wrong or right. What always seemed important to me about doing it, and many other modern dance positions-I’ll call this one the “hip wave”, is that they “align you.” You will find this (probably better explained in many modern dance technique books.” I recommend two (2)-On The Count of One and The Dancer Prepares (I am always recommending these-there are many more), just two classics. I am classic-that is another way of saying older. The exercise: It is sort of like wearing a blindfold and smelling, tasting, hearing and feeling stimuli, without the use of sight-let’s us not forget that sixth sense of (sylph) perception. Lying on the floor can help you with many problems-immediately note the amount of curvature in the spine, translated into not feeling the lower back (or any other part of the back!) resting on the floor. Breathing will help with this-another post. Feel the part of the back that receives more pressure (and is doing more work) which will be tighter and uncompromising-this is what you need to focus on relaxing into the floor. Part of any dance technique, ballet included is communicating with your own body-before you can communicate to others, you have to have control of the self. If your body is not doing what you tell it to, order or demand it to, then it is time to start some serious investigation into your sylph, and find a way to reach your body, just the way you might try to reach someone else. Why try less hard when the stubborn party is you! More reason to be able to teach it….be successful. In this position (above pictured), as in other positions of modern dance, at first you will possibly feel completely disoriented. I am not talking about gymnasts, handstands or other “set” movements that may be a part of your everyday routine or circumspect. I am talking about isolating what makes you feel uncomfortable and why, then reworking it, or controlling it, to get it to work for you-find out what is so great about it/not so great, by experimentation. I could steal other writers and bloggers and websites information and give this information to you in boring technical terms, sports terms, but it would not really reach most dancers. Dancers are visual and sensitive creatures frequently who learn best by delving into self exploration, diagnosis and psychology-and they are right. I am asking you to assume this position and let it control you, in a way. The dancer above is in control of this position, but in being so controlled, she is losing out on the many possibilities of the position and assuming just the one rather tense/practiced one we see. It looks alright, maybe too perfect, to some teachers, absolutely incorrect modern. The purpose of this position for say Isadora Duncan or Doris Humphrey might have been freedom, letting go, discovering one’s range of movement. In isolating this aspect, we simply increase the tension in order to control the pose-not what will be helpful, in short-more harm, useless. What about letting the leg go where it wants initially, playing with it, and then possibly, letting the leg fall naturally in a 360 degree circle, bringing it back up each time after it falls to its maximum ability to do so? What is wrong with falling, letting go? The muscles of the rest of the body will act to protect you, let them. See how they do this. Trust them. Don’t think so much about thinking so much! Raising and lowering the leg in a relaxed fashion, is much more difficult in this position than it seems because you are fighting the natural use and range of your muscles. It’s funny how gravity pulls the leg “up” and our instinct is to pull it back down (up). It feels very unnatural and there couldn’t be anything more natural about it. Imagine being in space-anti-gravity. Watch a child do it-there will always be one who spends a lot of time in this position-dancer. For whatever reason, this child knows this is funny and will often laugh to himself because you (adults) do not get it. They immediately understand why this is not “normal” as if they have discovered something no one else has, giving them power over their elders. They will try various things in this position, trying to emulate an “upside-down person”, a “backwards” person. They will try to walk and run backwards after this, and do other things the opposite way, realizing that not only are unexplored ranges of movement challenging, they are the antithesis of moving forward, possible, interesting. Life moves you forward, the coach yells “go” and you do not move backward-this would be seen as retarded to middle-school students, dumb. It is the joke in many Disney and related children’s movies, slowly reaffirming silently to children acceptable and unacceptable behaviors and it is the slow progression of “speeding up,” industrialization, which prevents many people taking the time to sit through a ballet or dance program. What child or any human, left alone, does not find the movement of motion pictures fascinating in reverse? This era knows the dvd, but what of the vcr, microfiche-or the pages of a book read backwards? Of course, once we explore this range we forget its initial curiosity, take it for granted, and continue to move forward the rest of our lives, but the truth is you can get to the same destination by turning around and walking backwards-but we lose the sense of where we are going, because we are not trained, so dependent are we on our eyes, to proceed without them leading us. If our other senses are engaged more frequently, they become better honed and more useful. Doing it “with your eyes closed” is losing meaning in today’s society. But life is busy and hurried and we do not take the time to “look back,” so even more oftentimes, it is hard to see beyond…. When in this position for the first time, do not use a mirror to check your progress or how you look. Try to adjust yourself to your surroundings-yourself and the planes of space. The ceiling is now the floor-or is it? Actual dancers spend much of their time in the air, being suspended by a partner, and diving or jumping-all leaps of faith and it is very important to get used to having to realign yourself without two feet planted on the floor. Close your eyes if necessary to block out external stimuli and find your center of balance. Then raise your leg as high as you can comfortably. Comfortably is the key word here. Do not lock your hip. Use your toes and back and arms. Forget what you have learned in ballet or dance class-it does not help you here. Move your leg around in a complete circle-not all at once, and slowly. Floor-range, at every conceivable angle and degree. Then try the other leg. It may be necessary to “come up for air” as this is fatiguing and when fatigued, we grip, we try to hold on, keep it up. Not yet. let it fall! Don’t grip your hips. Once you start to feel the movement within your hip, you will also begin to notice the muscles that naturally are in use. These are the muscles that will be strengthened with this exercise. and your mind. You are letting your body teach you where your range is, and this is it, really, naturally. You begin to see the strength of gravity and how much a leg actually weighs! Quit a lot. You see how you have trained those muscles to teach that leg to do everything from an upright position. How you are not uniformly strong-how naturally weak those muscles are in reverse. Interesting. You can strengthen back muscles from this position, too. It is a natural trait for the muscles to try to lift the leg and you will find this is what is most fatiguing this exercise or position is, as apparently we all have really weak backs in different positions. It is rare to find a person unilaterally trained. As you adjust to your new range, you can increase strength and turnout from this position, too. You can gradually rehabilitate your hips and isolate problems with your usual alignment from this and other unusual positions. This tricks your body into “starting over” putting your body and your sylph back into control one step at a time, one exercise at a time, one day at a time. You can learn to “tilt” into and out of this position and to increase your range of movement front to back, side to side, and all places in between. You will find muscles in your sides that are not strong, not being spoken to, not trained. Forgotten. its possibilities seem almost endless if you are willing to discover them. You can attempt it on releve. It is just one point of discovery, but it is a good place to start learning where your actual turnout is, how you can gently improve it, and whether you are forcing turnout all around. Since there is no place for you to lean, or rest against, although you can try that too, one is relying on one’s own body for support and one’s mind and tendencies for instinctual directions or fixes. Try to do this bending one leg, or both, turn, scoop, and a whole new plateau of movement will appear, a level, literally, not experienced by most classically trained dancers or grown-ups. I think this might have been how modern dance technique was discovered. What are we not doing?? ?There are six strings on a guitar, 12 on a classical. A dancer should have use of all 12 strings of his/her instrument, not half or a third, or one. Right? I have known guitarists who can get nearly all of the same notes out of a six-string guitar, but it quite a bit harder on the instrument and the guitarist. It is more work. Although the common issue of hip pain when forcing turnout can lead to other injuries, particularly fractures of the femoral neck, bursitis, tendonitis, etc….even actual displacement of the hip (yup), finding your correct turnout is like a key and a lock. Every mechanism is different. You cannot put your key into the grooves of your lock like everyone else-you have to find the groove that will allow your leg to rise comfortably, turnout comfortably. It is not the dancer with the perfect flat turnout it is the dancer with the comfortable turnout, beautiful turnout, that catches our eye. If your key will not turn in the lock, chances are, you are trying to move your leg against the cup-shaped acetabulum, hitting it against the mechanism, just like a key in a lock. If you train the muscles and ligaments around that area to “force” the leg through unnatural poses, it trains the muscles to repeat this exercise even when you tell it to do the right thing-muscle memory. It is akin to walking into a wall-you will either directly hit it like a bird on a sliding glass door, or you will scrape and careen off it, damaging the bursa and the cartilage in the joint. It should be a smooth transition with no bumps or scraping. If you notice these feelings when doing this exercise, the best thing to do is to see a doctor. If you are still in the preliminary or early stages of experiencing this problem no permanent damage might have occurred, at least not irreversible damage (possibly), and id instructed by your doctor, you could then see a physical therapist for exercises to do for increasing the correct usage of the surrounding muscles and ligaments as well as for strengthening the leg in the socket and increasing mobility in the hips. Another symptom of gripping the hips is that your derriere will get bigger, or appear to, because the muscles are tight. There is a stretch called “the triangle” to help remedy this condition. Probably stemming from yoga exercises, this will help loosen your gluteous maximus muscles after a workout. As long as you are warm, this exercise can be done often, but try not to sit in it too long (15-30 second holds, building up from 2-5 times per leg). Warm up for 5 to ten minutes at least to increase circulation in the areas you are going to stretch do that the exercise has a maximum benefit to those targeted spots-you will feel it if it is working and it will not feel as keyed in if you do not-you will learn the difference. A brisk walk will suffice if you are not dancing. It works best after a class, especially one in which you lift your legs a lot and this works well after pointework. Begin to slide your right foot more toward your buttocks (and up toward your chest), keeping your position aligned as before (spine, flat feet, ankles together, shoulders down). If you need to, use your hand to put your leg into a position closer to your body-after practice, you will not need to “assist”. Your right leg will be forming a “comfortable” triangle with the floor. 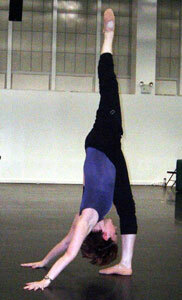 Picture the next pose, which is to bring the left leg up and over the right, when preparing to position yourself. You will be aligned with the right knee directly in front of or “square,” with your pelvis. Now, pull in or “retract” you left leg, until it is also in a triangle and put it over your right leg. Slide your left foot along the floor, resting it alongside your right hip and forming a triangle with your left leg. Make whatever adjustments are necessary to “stack” your left knee directly over your right. Press your inner thighs together gently. You should feel a little tension in your outer left hip. Also, there is a tendency for the left hip to raise, the right hip to press into the floor and the alignment to go awry. take a moment and find a comfortable but correct position with the hips “square,” both as much on the floor as possible, back straight and shoulders down.-this is a continual battle and part of the “fun.” This natural and correct alignment will do wonders for your stretch and your pose-almost no one doesn’t have stretching going on somewhere in this and those especially “out of shape” or incorrectly trained, will have much to grapple before becoming fluent in this pose and able to control it for the best stretch.One problem with people who believe they have control of this stretch is the tendency to grip with their hips, the floor and use the stomach muscles to “scoop” the leg into position. It is the back, straight, which gives the support necessary to relax the leg and for “crossing over” the other leg. Keep your back long and extend forward from your hips, placing your fingertips on the floor in front of you for support. When you feel moderate tension along your left buttock, hold the position for up to 30 seconds, breathing normally. Return the torso to an upright position and then repeat the forward hinge up to four times, then reverse. This link has some of the information here and a “training program” available online, although all of this information is generally available elsewhere. If you live in NYC-OUT THIS NUMBER IN YOUR CELL PHONE NOW! The Harkness Center offers one-hour, free-of-charge injury prevention assessments for dancers. During the injury prevention assessment session each dancer is seen individually for an hour by a therapist who reviews the dancer’s complaints, medical and nutrition histories and performance during a battery of tests. The screening is designed to evaluate the risk the dancer is exposed to and to discuss the dancer’s concerns before an injury occurs. At the conclusion of the assessment the dancer is given an individually tailored injury prevention exercise regime with recommendations for modification of their technique, training strategies, footwear and/or dance environment. The aim of the screening is to maximize each dancer’s potential for wellness. Thousands of dancers have participated in this program and have rated it 3.9 out of a perfect 4.0 for its relevance and helpfulness. Harkness has educational programs for dancers!